We’d love your help. Let us know what’s wrong with this preview of How to Catch Santa by Jean Reagan. From the creators of the New York Times bestsellers How to Babysit a Grandpa and How to Babysit a Grandma comes an equally charming and hilarious holiday offering! From Jean Reagan and Lee Wildish, creators of the bestselling HOW TO... series, comes From the creators of the New York Times bestsellers How to Babysit a Grandpa and How to Babysit a Grandma comes an equally charming and hilarious holiday offering! To ask other readers questions about How to Catch Santa, please sign up. The story was cute, but in a way kind of boring. It basically talked about ways you might catch santa and what to do, or not do. Just 3 stars as it just didn't keep our interest and isn't one of favorites. Best read when your child in old enough to have a serious inquiry regarding Santa but still young enough to believe. Lee Wildish’s colorful illustrations make this book a worthwhile addition to your seasonal collection. 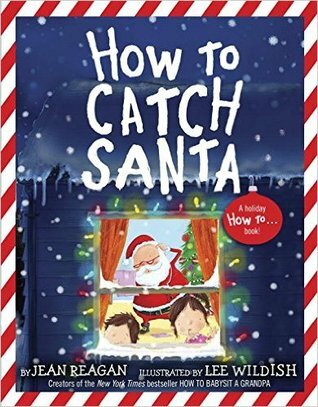 How to Catch Santa by Jean Reagan and Lee Wildish is such a fun read and perfect for children who believe. Filled with colorful images it explores how to catch Santa on Christmas Eve. What will you do if you catch him? Do you have questions? It shares how to listen for Santa and how to hunt for clues that he has been there For example, add glitter to a letter you leave for Santa, or place carrots outside for the reindeer. 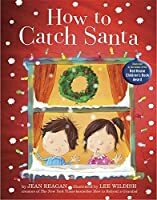 The book is for readers ages 4 to 8 but is perfect for reading to the litt How to Catch Santa by Jean Reagan and Lee Wildish is such a fun read and perfect for children who believe. Filled with colorful images it explores how to catch Santa on Christmas Eve. What will you do if you catch him? Do you have questions? It shares how to listen for Santa and how to hunt for clues that he has been there For example, add glitter to a letter you leave for Santa, or place carrots outside for the reindeer. The book is for readers ages 4 to 8 but is perfect for reading to the little ones this holiday season. The colorfully illustrated images will hold their attention and giggles are sure to ensue. Geared to spark the imagination it is sure to lead to questions and a fun family discussion. I would not be surprised if this became a family favorite. If you are looking for a fun holiday gift, this beautiful hardcover edition is sure to make them smile. First published on my blog, Nine Pages . I didn’t realize that this was of the same series as How to Babysit a Grandpa, Grandma, and Surprise a Dad. As well as those first two especially have been selling, I have not read any of them, and I was not particularly thrilled by this one. There’s not a lot of story, but a lot of text. “Don’t you have a zillion questions?” A list of questions follows. “Maybe you have things you want to tell him?” A list of things that you might want to tell Santa follo First published on my blog, Nine Pages . Have you ever wondered what you could do to catch Santa Claus on Christmas Eve? Author Jean Reagan and Illustrator Lee Wildish provide the best 'how to' in trying to catch the Jolly Ole Man. 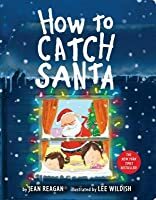 With questions, ideas and lists on all the ways you can try and catch Santa, young readers will enjoy reading about the two siblings as they try to catch Santa. As we all know, it's no easy feat staying up all night to try and sneak a peak at him, let alone capture him. With it's bright and cheerful illustrations, this fun 'how to' story is one readers of all ages will get a laugh reading. 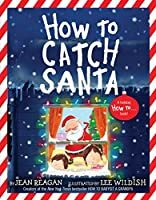 How To Catch Santa is a fun filled holiday book on all the ways kids can try and catch the man who brings joy and wonder to kids young and old. This was a good, fun read, and one we'd recommend picking up. It's a great read for all those who believe in the magic and fun of the Christmas season. If you want to catch Santa this Christmas, this is the book for you. It walks you through the process, from setting the trap to what questions to ask once you've got him. It also tells you what not to do, like setting up nets between palm trees. It's funny, cute, and already has my kids planning out their Santa traps. I would definitely recommend this book to anyone with kids that want to see the big guy himself on Christmas Eve. It goes best with a wild imagination. Just sayin'. Find more Christ If you want to catch Santa this Christmas, this is the book for you. It walks you through the process, from setting the trap to what questions to ask once you've got him. It also tells you what not to do, like setting up nets between palm trees. It's funny, cute, and already has my kids planning out their Santa traps. How to Catch Santa puts a fun twist on the many thoughts of the young around the holiday season. It is what seems like the popular yet impossible task for every young child today, catch the real life Santa Claus! After waiting a whole year there are so many things to think about before catching Santa. What will you ask him? What will you tell him? HOW are you going to catch him? 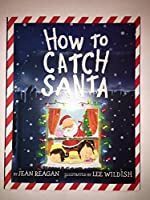 How To Catch Santa by Jean Reagan shows the endless possibilities for a child and it completely opens up their imagination and spirit of the season. Before Christmas break each student needs to write a letter asking what they would like for Christmas to be then mailed to Santa. Then, the students will create their plan of action for their catch on Christmas Eve. How will they Catch Santa? What will they do with him after they have him? Let the students be open ended and creative. After the holiday break, each student will come back and write a thank you note for Santa. Thanking him for all he does and the nice gifts him or her received that Christmas, these are also to be mailed to Santa. How to Catch Santa is a children's picture book written by Jean Reagan and illustrated by Lee Wildish. It is a story about how to catch Santa Claus and what to do with him if you are successful. Today is Saint Nicholas Day so I thought it would apropos to read this book today. Reagan's text is simplistic, straightforward, and rather hilarious. It is a story about adventurous children trying to catch Santa Claus. It is an instructional guide to how to do such a thing and what to do with Santa Clau How to Catch Santa is a children's picture book written by Jean Reagan and illustrated by Lee Wildish. It is a story about how to catch Santa Claus and what to do with him if you are successful. Today is Saint Nicholas Day so I thought it would apropos to read this book today. Reagan's text is simplistic, straightforward, and rather hilarious. It is a story about adventurous children trying to catch Santa Claus. It is an instructional guide to how to do such a thing and what to do with Santa Claus once he is caught. Wildish's illustrations are wonderfully depicted, a tad too cartoonish for my taste, but it was appropriate for this narrative. The premise of the book is rather straightforward. It is a group of children trying to catch Santa Claus as he descends to their house on Christmas Eve. It is all in the preparation and if one is lucky one could catch him, but more often than not – only traces of his appearance could be found the next day. From the same author who gave us How To Babysit a Grandma, and How to Babysit A Grandpa, both pretty humorous books, we now have How To Catch Santa. This is the book I sent to my oldest Grandkids, both of whom (as we are to be so lucky) will be "snuggled down" right here at our house this Christmas Eve. Here's hoping Santa manages another annual visit without incident !! Most kids will be able to remember different ways that they, too, have tried to catch Santa. This fun picture book gives young readers advice on different ways to get ahold of Santa or at least catch a glimpse of him. This could be a great mentor text for other “how to” stories related to the holidays. My kids and I thought that this was a cute book. It gave the kids small ideas about how to catch santa but never pushed any ideas. They can always try again next year. I would recommend this book to others. Have you ever tried to catch Santa? What have you tried? Have you come close? How do you know? What is the evidence? These, among so many other questions, and efforts, are delivered in a fun and colorful story as two siblings prepare for the big day. This practical guide informs kids not only how to catch Santa--which involves glitter, riddles, and cookie manipulation, but also what to do during the few minutes they have with him. Reagan provides tips for catching Santa or at least confirming he was there. Great to some of these activities together as a family on Christmas Eve. Charming illustrations support the text. Such a cute book! .So many great ideas listed in here.I am confident we will catch Santa this year..
super cute book. I love this "How to" series. Some cute ideas for kids to try to catch santa and it also supports accepting that you may not. If you like reading long lists to your children, you might enjoy this. Otherwise, read the front endpapers and skip the rest. Adorable, silly, and a fun format that leads to a fun read-aloud. Just read it with my 7-year-old. She gave it 4 stars. The notes on the front and back of the book are great! A little late in the game, but your little ones will LOVE this book, in anticipation for Santa's visit. Jason? Cute as all the other “how to” books, be sure to read all the endpages! Of all of the books in this series, this is my favorite so far. I kind of feel like the series is wearing thin, but this is a happy discovery! A funny how-to book with great ideas for children who want to catch Santa on Christmas Eve. Great illustrations.